Three separate nonfiction text selections from a nonfiction or fiction text. Students will be able to cite an author’s point, a supporting reason, and evidence from a nonfiction text. Tell your class that they’ll be exploring answers to questions about a text, such as: What point was the author trying to make? How do you know? Where’s the evidence? Explain that an author’s point is an idea she or he is trying to make in their writing and that evidence is the proof that supports their point. Read the first of three nonfiction text selections. The selections should be no longer than a paragraph in length and include an author’s point with two instances of supporting evidence. Have students discuss what they think the author's point is, along with evidence that supports it. Set up the completed Author’s Claim, Reason, and Evidence teacher model covering everything but the title and author. 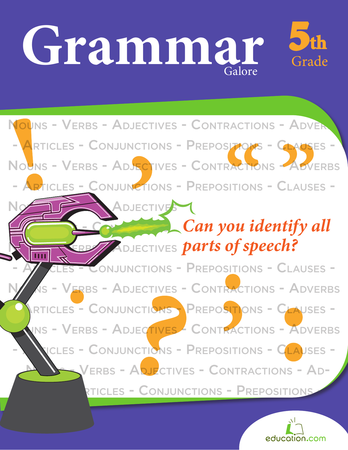 Go over the first section of the read-aloud, moving from author’s point, to reason, then evidence, revealing the previously filled out answers as you discuss each part. 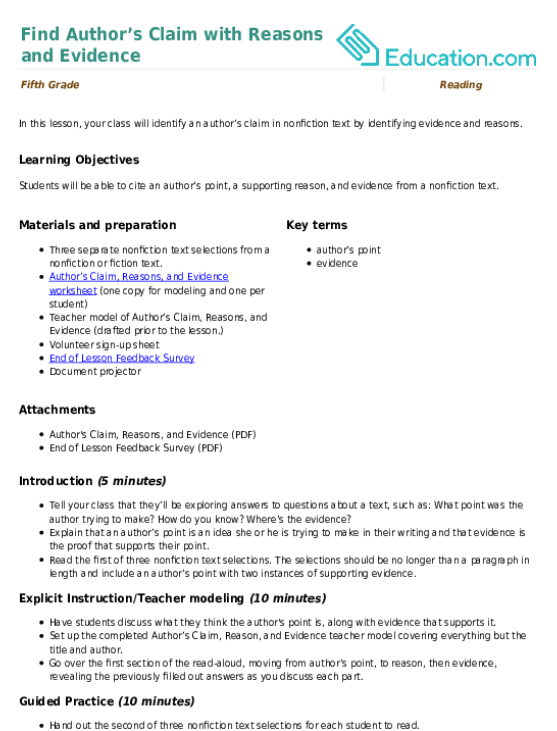 Hand out the second of three nonfiction text selections for each student to read. As they finish, have your class think, pair, and share the author’s point, reasons, and evidence with a partner. 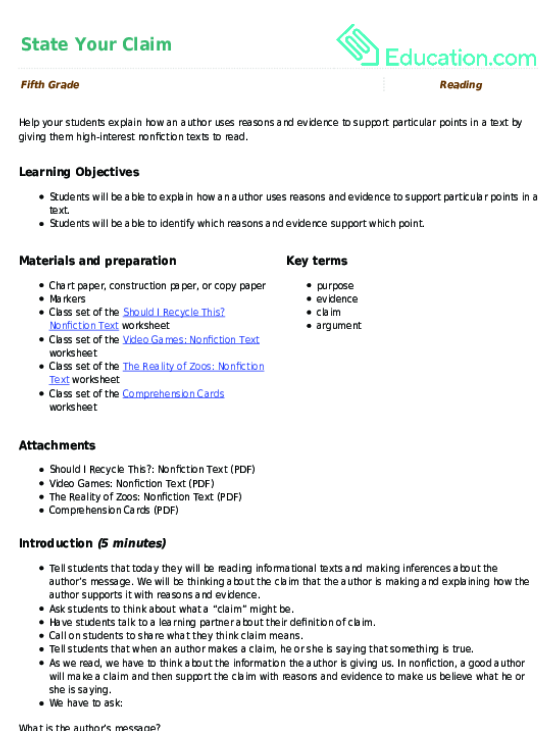 Have your students fill out section B of the Author’s Claim, Reasons, and Evidence worksheet in their partnerships. Review class answers and provide feedback on clarity and accuracy of their responses. Explain to you class that they will then perform this activity on their own with a third nonfiction text selection. Instruct them to fill in sections A and B of the Author’s Claim, Reasons, and Evidence worksheet. 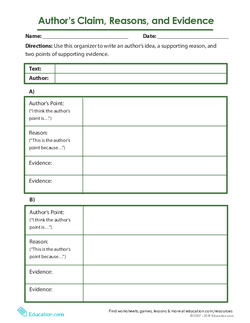 Hand out a copy of the Author’s Claim, Reason, and Evidence worksheet to each student. Answer any clarifying questions about the assignment. Post the Volunteer Sign-Up sheet for student groups or individuals to share their finished work during review time. Explain your class work time expectations and protocols. Instruct students to begin working. Offer these students copies of the Author’s Claim, Reasons, and Evidence worksheets with a prescribed text selection and author’s point so that they can focus on the reason and evidence. Classmates can work in strategic partnerships at your discretion. Students may choose their own text selections from the prescribed text or a different text during work time. Walk around during work time and check in with students to see that they have valid points, reasons, and supporting evidence. Ask leading questions to assist as needed. Examples include: Where is the evidence in the text that supports the author’s point? What’s the point and how do you know? A student roster with blank columns can be helpful for taking notes on each student as you perform quick check-ins. Assessment time is embedded into class work time. However, student work may be collected for review at a later time. Feedback forms at the closing of the lesson can be reviewed at a later time to evaluate how the lesson was received and to gather future teaching recommendations. Allow class groups or individuals from the Volunteer Sign-Up sheet to share their finished work. Have your class work in partners to complete their End of Lesson Feedback Surveys and collect them. 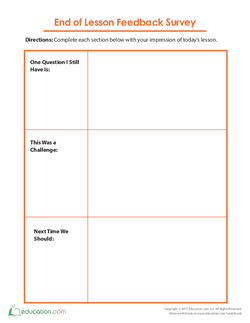 This worksheet gives your students practise reading and analyzing informational text to explain the author’s claim and supporting reasons. This graphic organizer helps students work through a nonfiction text to help organise information about the author’s point, and the reasons and evidence used to support it.